THREE firefighters have been injured after a devastating explosion that turned a Hinckley tyre depot into a fireball. 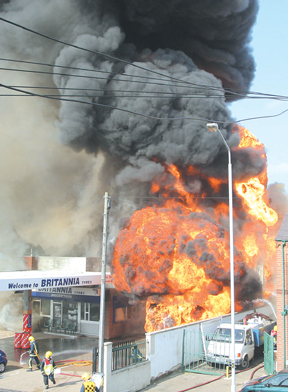 The officers were hurt as they tackled the raging inferno at Britannia Tyres which caused chaos in the town centre. Residents and workers had to be evacuated from homes and businesses as the town centre became a virtual ‘no-go’ zone as acrid smoke blanketed the area. Hours after the explosion at just before 1pm yesterday, the effects were still being felt as roads were closed, with traffic gridlocking the area and householders told to close their windows to keep out the toxic fumes billowing from the burning rubber. It is believed that a car blew up on the forecourt of the unit based in Derby Road, with the fire spreading through the business which had an estimated 2,000 tyres inside. At the time of going to press, no further details about the victims were available until their next of kin had been informed. The injuries were received during attempts to bring the blaze under control, with eight crews from Hinckley, Nuneaton, Bedworth and Atherstone fighting the fire from the ground and above using specialist ladders and wearing breathing apparatus. Police helicopters hovered as the drama unfolded, with the streets left coated in soot and debris, and trails of smoke seen in the sky as far away as Nuneaton. An eye witness who called the Heartland Evening News offices said: “It looked massive, the roof went up with a bang at one point and then everyone was moved out of the area. The blaze occurred as Hinckley Market was in full swing with a spokesperson for Hinckley and Bosworth Borough Council saying that everything was under control. “We do have an emergency plan in place in the event of such an incident, but the fire and police have the situation under control,” he said.